The very first time I ever laid eyes on him he really stood out from all the other kittens He had just finished eating spaghetti. He was just five weeks old. Called him over. And it was love at first sight. He already had his name and covered in sauce he looked like the cartoon Garfield I just had to keep his name . I overheard his owner say she couldn't afford to keep them all so I was with my dad and I told him I want him he's perfect and he said ok well call your mom and see if its ok with her. So I did and she said that it was fine so my dad convinced his friend the owner and they said it was alright and that I could have him. 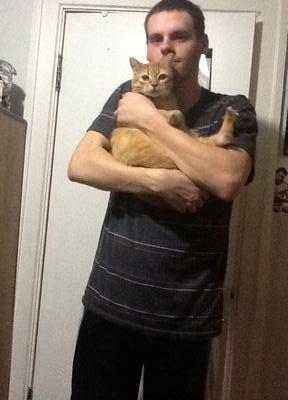 That was when I was 20 going on 21 and this July that was 7 years ago and I don't have any kids of my own with my wife yet so Garfield and our other younger cat Oreo are our kids and I'm proud of them. Thank you he is one handsome boy and yes after looking at him I just had to keep his name just to perfect.